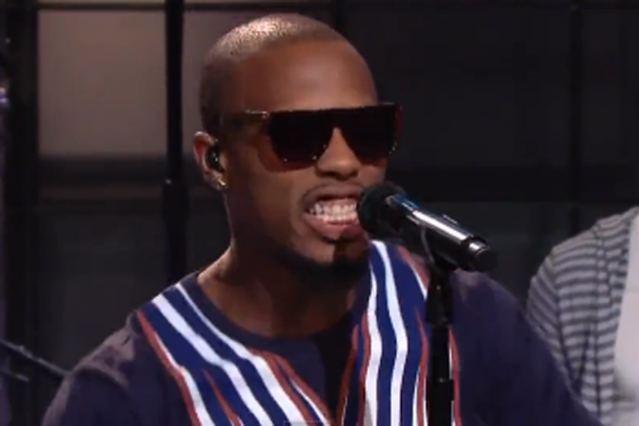 B.o.B Teams With O.A.R. in Nightmarish Marriage of Abbrev. The 'Strange Clouds' rapper-strummer and the seasoned party-rockers teamed up on 'Leno' last night to perform a drippy anthem about, not a certain smokable substance, but … the Olympics? We already know B.o.B will collaborate with anyone who moves units, but this is ridiculous. Bobby Ray, the Atlanta rapper-singer with a latent and unfortunate coffeehouse-strummer streak, and fellow abbrev. users O.A.R., the rockers who rode their poor-man’s Dave Matthews Band jams all the way from Ohio State frat parties to a sold-out 2006 Madison Square Garden show, have teamed up. Although both the Strange Clouds artist and the “That Was a Crazy Game of Poker” brahs cater to a weed-friendly audience, their collaboration does a flip turn worthy of Michael Phelps: Titled “Champions,” it’s a song tied to the 2012 Summer Olympics. B.o.B and O.A.R. performed “Champions” last night on The Tonight Show With Jay Leno (via Yardie), and it’s exactly the type of blandly drippy anthem these types of big events tend to attract like flies. “The world is a battlefield / The fight is a fireplace,” B.o.B. begins, in a grim sign of the emptiness to come. “We’re all champions,” O.A.R. frontman Marc Roberge croons in his best Bono vox, waving his hand hilariously when not pointing to the commendable Beastie Boys logo on his T-shirt. The music is the type of vague midtempo synth-rock uplift that would’ve sounded equally uninspired in 1988, 1992, or 1996, with the band’s admittedly talented saxophonist Jerry DePizzo reserving a couple of glossily retro honks until the end for good measure. As inspirational songs go, Lil Wayne’s “I’m Me” — which weed-smoking Olympic gold medalist Phelps once told The Today Show he listened to — this isn’t. The two acts explained their collaboration, which is part of Duracell’s “Rely on Copper to Go for the Gold” campaign, in interviews with Yahoo Music Canada (Canada?!). “I think the song is very synonymous with challenges that many people face in life even beyond the field, beyond the court, and beyond the sports,” B.o.B said. O.A.R.’s Roberge explained it seemed perfect for the Olympics. Watch the Leno performance and an in-studio video below. In the latter, B.o.B. can be seen reading lyrics like “It’s all that I’ve ever known / It’s all that I’ve ever seen” from his smart phone during recording. Or maybe he was just replying to a message from another performer associated with this summer’s London games, Damon Albarn.